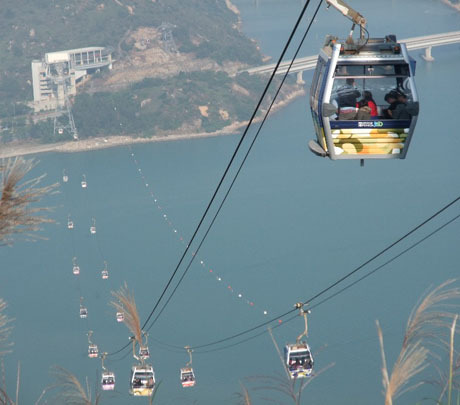 NGONG PING 360 CABLE CAR TEMPORARY CLOSURE 6th to 26th March 2019 - The Ngong Ping 360 cable car operating between Tung Chung and Ngong Ping is to close for scheduled maintenance from 6th to 26th March 2019 (21 days). Normal service will resume on 27th March. During the closure period Ngong Ping Village, the "Big Buddha", Po Lin Monastery, Wisdom Path and other attractions at Ngong Ping remain open as usual. Visitors can take alternative transport between Tung Chung and Ngong Ping, either New Lantao Bus Company service 23, which takes about 50 minutes and departs from Tung Chung Temporary Bus Terminus, adjacent to the cable car terminal on Tat Tung Road (additional services operate to meet demand) or, subject to availability, Lantau (blue) taxi, fare approx HK$180, journey time about 35 mins. Since its opening in 2006 and despite early problems Ngong Ping 360 (NP360) has rapidly established a worldwide reputation as one of Hong Kong’s “must do” tourist experiences. 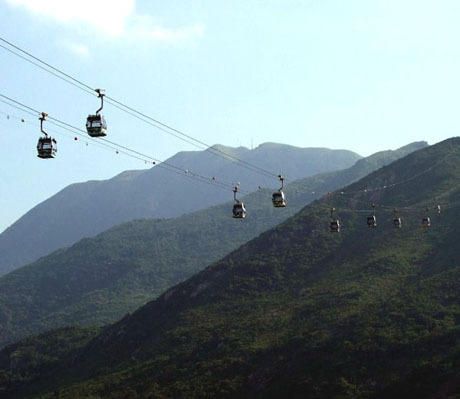 NP360 allows visitors the opportunity to enjoy a 5.7 km ride on a state of the art cable car system through outstanding scenery to a culturally-themed village and its surrounding attractions at Ngong Ping located on a high plateau in the heart of mountainous Lantau Island. 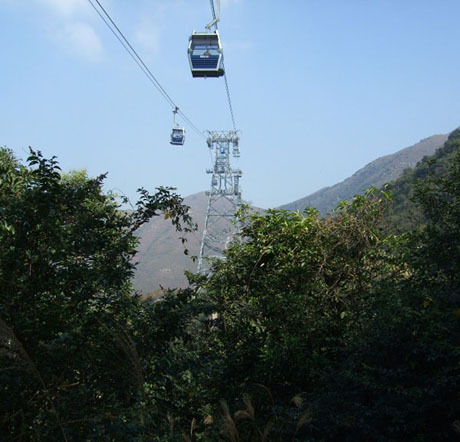 The 30 year franchise for ownership of The Tung Chung Cable Car Project (as it was originally known) was awarded by the Hong Kong Government to MTR Corporation Ltd (MTRC) in 2002 after proposals for a cable car system to link Tung Chung and Ngong Ping had first been put forward some ten years earlier. Construction commenced in February 2004 and NP360 opened to the public in September 2006 having cost in the region of HK$1 billion. The cableway system was built by Italian Leitner Group, a world-leading cable way company, civil engineering and building works were carried out by Maeda Corporation and Australian company Skyrail-ITM were originally appointed as operators of the system having owned and operated one of Australia’s major tourist attractions, a rainforest cableway at Cairns in North Queensland. Construction was undertaken in extremely difficult conditions in hazardous terrain in an area of scenic beauty in a country park and environmental impact of the project was a major consideration. One remarkable consequence of minimising such impact was that six mules brought in from Canada were used for transportation of materials, in addition to helicopters being employed for construction of the towers. 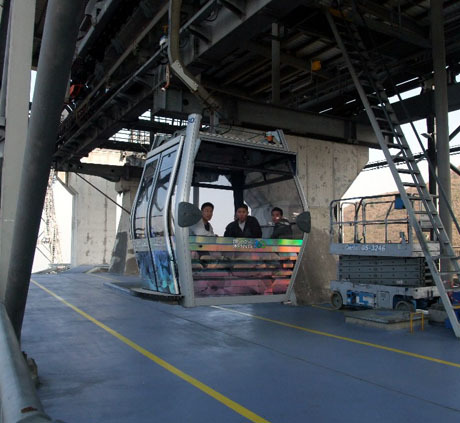 The cable car system is the largest aerial cable car system of its kind (bi-cable circulating detachable cable car) and incorporates eight support towers, two angle stations (for change of direction), 112 cabins (gondolas) and all the associated ancillary equipment. 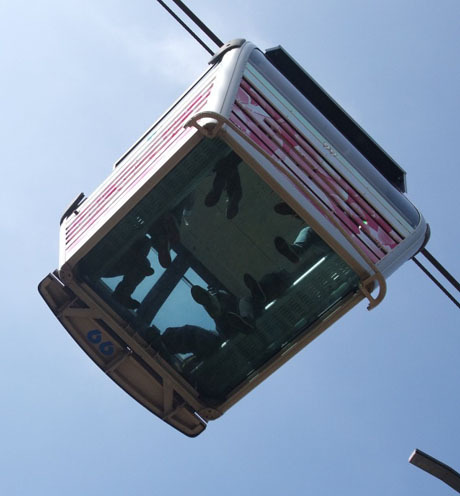 The ropeway which is capable of a maximum operating speed of 7 metres per second is a circular system operating in an anti-clockwise direction enabling cabins to be detached allowing passengers to embark and disembark at a speed of 0.25 metres per second. The project also included construction of the two termini, passenger transport interchange, Ngong Ping Village and a 5.6 kms, 1.5 metre wide emergency rescue trail and helicopter landing pads. In the unlikely event of an aerial rescue of passengers stranded in cabins having to be carried out there is an elaborate rescue plan in place involving some 199 emergency workers including 179 firefighters. NP 360 had a troubled early history. During its first nine months of operation there were numerous incidents and unscheduled service interruptions culminating in an out of operating hours incident in June 2007 when an empty cabin fell 50 metres into a valley during a manual brake test resulting in the system being closed down for some six months. The cause of the incident was human error and not electrical or mechanical defect but a report into the incident by a government appointed Expert Panel in July 2007 was highly critical of management and maintenance of the project and laid down strict criteria for its reopening which included replacement of parts, improved management and maintenance procedures, better staff training and re-testing and re-commissioning of the system. In September 2007 MTR Corp formed a new subsidiary company Ngong Ping 360 Ltd to replace Skyrail-ITM as operators who were effectively sacked. The new company is headed by a strong and highly experienced management team led by an ex-MTRC manager with over 24 years electrical and mechanical engineering experience and supported by several overseas cableway operators and engineers from Europe. The system was reopened to the public on 31st December 2007. 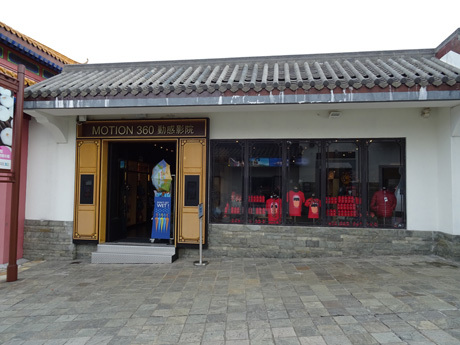 The new operators have done much to restore public confidence and despite its earlier problems Ngong Ping 360 has quickly restored its position as one of Hong Kong’s major attractions. Maintenance procedures have been strengthened although this necessarily means the number of days the system is closed for scheduled maintenance has increased. Communication with the public has been improved so that in the event of service suspensions notices are put up at entry gates to all MTR Tung Chung Line stations as well as public announcements being made along the line and media are notified as well as notices being placed on the NP360 website. Several special promotions and joint promotions with other Hong Kong attractions have been arranged to allow NP360 visitor to enjoy various discounts. Passenger numbers have grown steadily and during 2014 the cable carried over 1.83 million passengers. A general decline in visitor numbers to Hong Kong in 2015 saw a fall in annual patronage to 1.62 million with an average daily patronage of about 5,100 although at weekends and public holidays this can rise to 8,000 at weekends and on special occasions such as Lunar New Year the system has carried as many as 13,000 passengers daily. About 29% of visitors in 2015 were from mainland China and Macau, 21% were Hong Kong residents and 50% from Western and other Asian countries. The system is now operating at its maximum capacity of 108 cabins and in the event of passenger numbers continuing to grow the speed of travel may need to be increased thus shortening the journey time. 2016 saw an 5.5% increase in visitor numbers to 1.71 million with an average daily attendance of 5,234. 28% of visitors were from Mainland China and Macau, 57% were international visitors and 15% were local residents. The system operated at 99.87% average reliability with a delay rate equating to less than one minute in every 8 hours of operation. In 2017 the number of operating days was 120 fewer than the previous year owing to the 5-month rope replacement project in the first half which, as a consequence, resulted in a 38.9% decrease in visitors to 1.04 million. The average daily patronage saw a reduction of 3.2% to 5,086. 57% of visitors were from Western and Asian countries, 27% from Mainland China and 16% were local residents. In 2018 Ngong Ping 360 received 1.83 million visitors with a ten-year high daily average of 5,385. 58% of visitors were from Western and Asian countries, 27% from mainland China and Macau and 15% local residents. Visitor numbers from Thailand and the Philippines accounted for the largest increases, by 16% and 11% respectively. Average reliability of the cable car system also reached a record high of 99.93%. There were occasional minor unscheduled service interruptions since the reopening in December 2007 and the system had operated relatively trouble-free but four stoppages resulting from technical faults over a six week period during December 2011 and January 2012 have led to the system being closed from 26th January 2012, for a period expected to be about two months. In the last incident on 25th January 2012, which resulted from a worn bearing on the haul rope pulley wheel at the Airport Island Angle Station, 800 passengers were stranded for up to 90 minutes in freezing conditions. The bearing had been used for only 25,000 hours of its expected 90,000 hours lifespan. Following a thorough examination of the system it was decided to replace all seven bullwheel bearings and advance the annual servicing and examination of the system, usually carried out in June. Replacement of the bearings involved erecting frames to lift the bullwheels, each of which weighs between four and eight tonnes and the remote location of the system meant that helicopters needed to be employed to deliver the frames. Service resumed on 5th April 2012. During 2015 the system achieved 99.88% reliability. To offer an enhanced Ngong Ping 360 experience an initial twelve glass-bottom "Crystal Cabins" were introduced in April 2009 and more "Crystal Cabins" have since been brought into service. These cabins accommodate a maximum of ten passengers which is fewer than the maximum seventeen passengers which standard cabins can carry owing to the weight of the three-layer 5cm glass floor. The cabin exteriors feature metallic "colour-changing" paint. Prices for journeys in these cabins are about HK$50 more than the cost of travelling in a standard cabin. Ngong Ping 360 also has one "Sky Lounge" luxury private cabin for exclusive use, decorated with Swarovski Elements crystals. A new unified pricing structure for cable car journeys took effect from 1st December 2009 which ends the previous classification of operating days as normal days and special days and means ticket prices are now the same on all operating days. 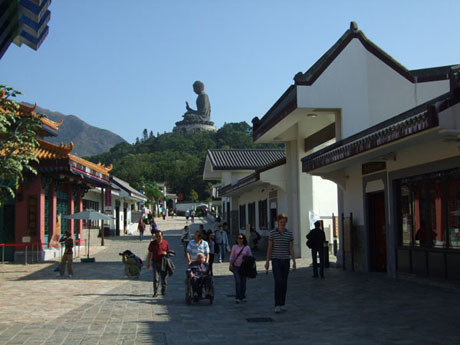 In March 2010 Ngong Ping introduced "360 Holidays Guided Tour" packages, offering options of a "Cultural and Heritage Tour of Lantau" and "The Walk to Enlightenment" and including cable car round-trip tickets although "The Walk to Enlightenment" tour wad discontinued but in June 2015 a new 360 Guided Tour "360 Buddhist Walk - a Trip of Enlightenment" was introduced. Further price increases have taken effect on 1st December each year until 2016, then from 1st September 2017 when an average ticket price increase of about 12.3% takes effect owing to increased cost cable car maintenance, procurement of components and staff salaries as well as investment in improved hardware and software systems. 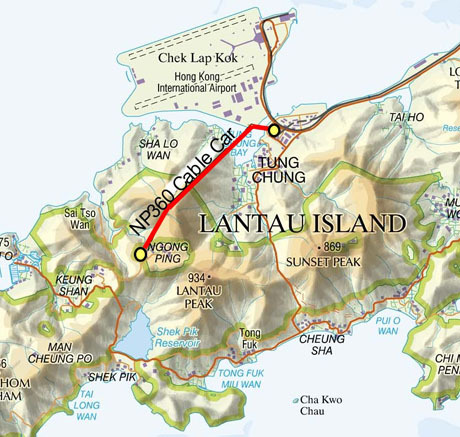 A feasibility study is to be carried out during 2015 by the Development Bureau to assess the viability of extending the cable car route beyond Ngong Ping to Tai O, a nearby coastal fishing village popular with tourists and famed for its stilt houses, as part of a wider study to develop Lantau Island. 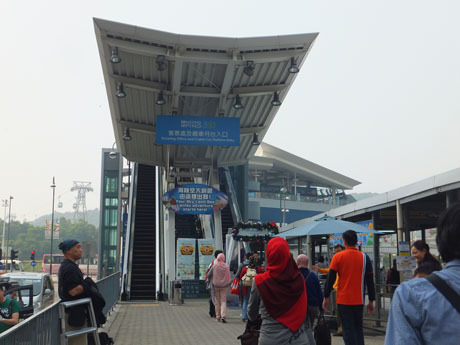 The Tung Chung Terminus is located in Tung Chung town centre next to Citygate Outlets Mall about two minutes walk from Tung Chung MTR Station (Exit B) and is easily accessible by MTR train and several bus services. The service starts at Tin Hau Station MTR Station Bus Terminus and serves Causeway Bay, Wan Chai, Central, Western Harbour Crossing and the Western Harbour Crossing Toll Plaza (Kowloon side of the harbour) before travelling via the Lantau Link. From Tin Hau the journey to Tung Chung takes about 55 minutes and buses operate at a frequency of 12 to 20 minutes from 5-20am until midnight daily. The service starts at Island Harbourview inside Olympian City 1 in Mongkok and serves Cherry Street, Prince Edward MTR Station (Nathan Road), and Sham Shiu Po before travelling via the Lantau Link. From Island Harbourview the journey to Tung Chung takes about 55 minutes and buses operate at a frequency of 11 to 20 minutes from 5-30am to midnight daily. All these services travel via Tung Chung and stop at “Tung Chung Crescent, Shun Tung Road” for the NP360 terminus. From Disneyland Resort Station take MTR train to Sunny Bay (4 mins) then change to Tung Chung Line for Tung Chung MTR Station (7 mins). Trains on the Disneyland Resort Line operate at a frequency of 4 to 10 minutes from 6-20am until 0-10am. Bus service S1 and S56 (jointly operated by Citybus and Long Win Bus Co) both operate a circular route between the airport and Tung Chung Station Bus Terminus. At the airport both buses stop on Cheong Tat Road outside the passenger terminal building at ground level below the Arrivals Hall. Bus S1 (about every 5/10 mins), via Asia World-expo, stops outside the NP360 Tung Chung cable car terminus on Shun Tung Road on the journey from the airport with a journey time of about 16 mins. Bus S56 is an express service (about every 20 mins) direct from the airport to Tung Chung Station, about 2 mins walk from NP360 Tung Chung cable car terminus, with a journey time of about 9 mins. Buses operate from about 5-30am until midnight. Most buses are equipped with luggage racks. There are luggage storage facilities at the NP360 Tung Chung Terminus with a charge of HK$80 per piece per day during normal cable car operating hours. Most passengers start the ride from Tung Chung Terminus. The 25 minute ride begins with the short hop across a sea channel to the first angle station on Chek Lap Kok (the airport island). The ride changes direction here and slowly climbs steeply over Tung Chung Bay as the hills of Lantau North Country Park loom ahead. The ride is flanked on one side by the green forested Tung Chung Valley and on the other by the north Lantau slopes and coastline whilst behind are stunning panoramic views over the airport and across the South China Sea to the New Territories. 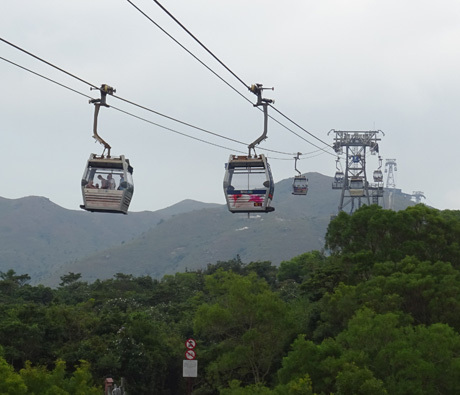 As the cable car glides silently across the country park the towering Lantau Peak in the far distance ahead dominates several lower hills and peaks whilst below the journey crosses valleys, streams and forests before the slow ascent of Nei Lak Shan where the ride reaches its highest point some 560 metres above sea level. From the second angle station the first glimpses of the Giant Buddha appear imposing a majestic air of serenity on all around. The breathtaking ride continues across more valleys and woodland until the monastic buildings of Ngong Ping come into view and beyond the plateau the south Lantau coastline is visible before the journey reaches its destination at Ngong Ping Village constructed in traditional Chinese architectural style. Occasionally mists can descend on the higher parts of Lantau Island particularly in early morning and under these conditions although the panoramic views can be restricted many visitors may consider the eerily haunting experience of gliding through the mist into the unknown just as exciting. 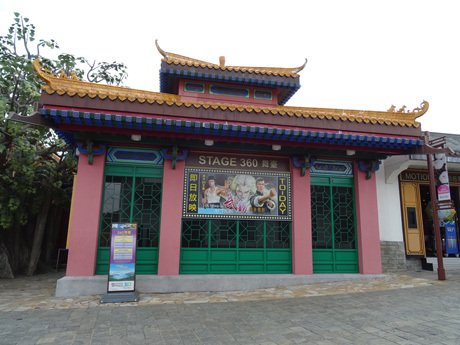 Ngong Ping Village is part of the Ngong Ping 360 experience. 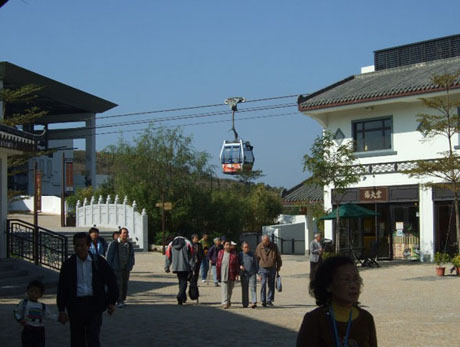 The village which opened at the same time as the cable car was constructed in traditional Chinese architectural style and designed to reflect the character of the surrounding environment. 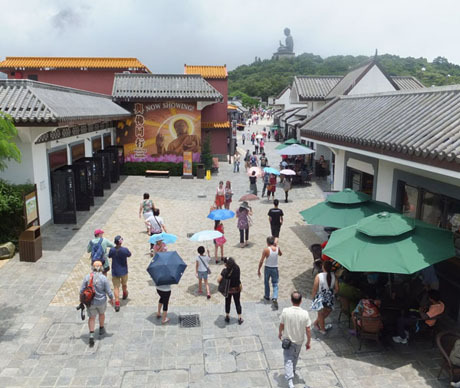 The village is home to “Walking with Buddha” attraction, a new XD theatre attraction (due to open in mid 2014 to replace “Monkey’s Tale Theatre which closed in late 2013), “Ngong Ping Teahouse”, Ngong Ping Nature Centre and a variety of restaurants, café’s and gift shops. There is a charge for entry to “Walking with Buddha” or visitors can take advantage of the “Journey of Enlightenment Package” which includes a cable car round trip and entry to this attraction. The small "International Cable Car Gallery" opened during October 2009 at Stupa Square inside the village and has since been relocated to the village entrance. This is an exhibition of eight refurbished and decorated cable car cabins from Italy, Germany, France, Brazil, Mainland China, Spain, Austria and Switzerland. Ngong Ping Village is just a short walk from the Tian Tan “Giant Buddha”, Po Lin Monastery, and Wisdom Path via the new Ngong Ping Piazza which was officially opened in August 2010. The HK$77.5 million project for the 1.5 hectare piazza took almost two years to complete and features of the piazza include a new Pai Lau, Bodhi Path, Di Tan and Chinese landscaped garden. Ngong Ping Sewage Treatment Works, located next to Ngong Ping Village and commissioned by the Drainage Services Department in 2006, serves a population of 40,000 including residents of Ngong Ping and tourists. It has an information centre with small exhibition which is open (free admission) to the public, Tuesdays to Sundays from 10am to 12-30pm and 1-30pm to 4-30pm. It is closed on Mondays, New Year's Day, the first three days of Chinese New Year, Good Friday, Christmas Day and Boxing Day (Dec 26th). There are a number of hiking trails and scenic paths accessible from Ngong Ping including the Lantau Trail, Tung Chung Valley, and Ngong Ping 360 Rescue Trail (undertaken at own risk) to Tung Chung. 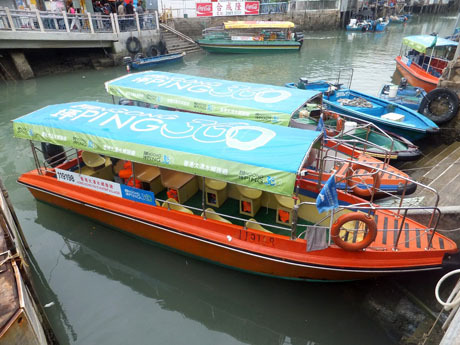 The historic traditional fishing village of Tai O with its stilt houses can be reached in about 15 minutes by bus service 21 from Ngong Ping or by taxi should cost no more than HK$60. 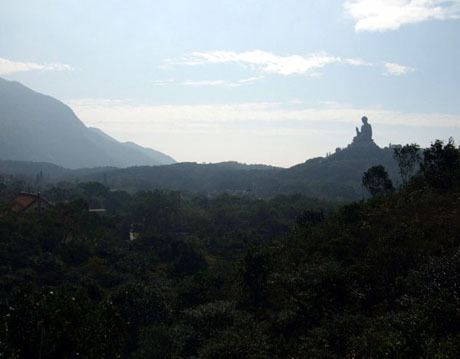 Ngong Ping Village and attractions and businesses within the village, as well as the "Giant Buddha" and Po Lin Monastery remain open during maintenance days. During maintenance closures visitors can reach Ngong Ping from Tung Chung by New Lantao Bus service 23 (journey time 45/50 minutes) or by Lantau (blue) taxi (fare about HK$180). The cable car does not run in extremely adverse weather conditions or when Typhoon Signal 3 or higher is hoisted. Fares were increased from 1st September 2018 and are HK$235 for an adult round trip, HK$110 child 3-11, HK$155 Hong Kong Senior Citizens. Single trip fares are HK$160 adult, HK$75 child 3-11, HK$105 Hong Kong Senior Citizens. Glass-bottom "Crystal Cabins" were introduced into service in April 2009. With effect from 1st September 2017* adult fare is HK$215 one-way (HK$135 child 3-11, HK$156 Hong Kong senior citizen) or HK$315 round-trip, (HK$190 child 3-11, HK$235 Hong Kong senior citizen). Private cabin service includes round-trip cable car ride in a private cabin (standard / crystal cabin), fast lane for ticket purchase, priority boarding and free admission to Ngong Ping Village's "Walking with Buddha" attractions. Standard Cabin HK$3800 per cabin, Crystal Cabin HK$4500 per cabin. Ngong Ping 360 introduced a new 360 Fun Pass from 1st January 2016 which includes round trip cable car ticket with admission to all attractions at Ngong Ping Village, including Stage 360, Motion 360 and Walking with Buddha. Prices from 1st September 2018 for the 360 Fun Pass are HK$315 (Standard Cabin) or HK$390 (Crystal Cabin). Tickets can be purchased from the Ngong Ping 360 termini at Tung Chung and Ngong Ping. Pre-dated vouchers can be purchased at MTR Customer Service Centres at Hong Kong Station, Causeway Bay Station, Tsim Sha Tsui Station, Kowloon Tong Station, Hung Hom Station, Mong Kok East Station, Tin Shui Wai Station and Tuen Mun Station or from travel agents. These vouchers are redeemable on the valid date at Ngong Ping 360 ticket counters at Tung Chung and Ngong Ping termini. Vouchers can also be purchased at any 7-11 convenience store in Hong Kong except those at Tung Chung and Ngong Ping and can also be purchased at "eInstantBonus" terminals at some MTR stations. Same day tickets can only be obtained from the ticket counters at Ngong Ping 360 Tung Chung Terminal and Ngong Ping Terminal. Octopus Card cannot currently be used for payment for tickets for travel on the cable car (for various operational reasons) but can be used in the NP360 souvenir shops. Free wi-fi is available at Tung Chung and Ngong Ping cable car terminals and throughout Ngong Ping Village.